The Intense Series 3100 are very high brightness AlGaAs lasers. These lasers have small emitting apertures and power from 15 mW/um to 20 mW/um of junction length. Aperture lengths include 50 µm, 100 µm and 200 µm. All lasers are multi mode with a spectral width of approximately 2 nm. 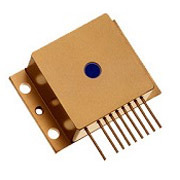 The low thermal resistance of P-down mounting combined with high efficiency quantum well structure provides low junction temperature at high optical power. Easy to use package options include C mount, 9MM, TO3 with TE cooler and HHL with TE cooler. Fiber pigtails are optional in TO3 and HHL packages.